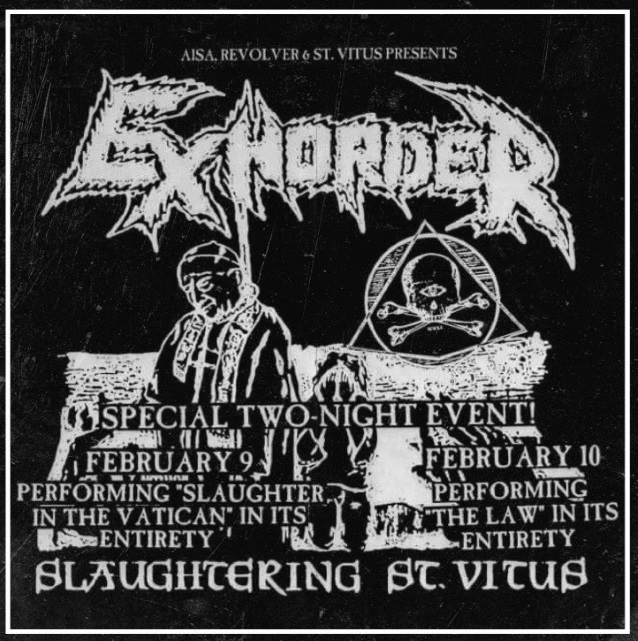 The new lineup of the legendary American thrash metal band EXHORDER made its live debut on February 9 at the St. Vitus Bar in Brooklyn, New York. Official video footage of the “Legions Of Death” performance from the concert can be seen below. EXHORDER is planning on making several festival appearances during the summer. EXHORDER relased two albums in the early 1990s through the Roadrunner label — 1990’s “Slaughter in the Vatican” and 1992’s “The Law” — before breaking up, with Kyle going on to form FLOODGATE and also briefly appearing live as the vocalist for TROUBLE, which he later joined on a full-time basis (and is still a member of).